Available from October 2016, the Aero-PTZ (WV-SUD638) provides Full HD 60fps imagery with a 30x optical zoom lens within a tough fibreglass body resistant to both erosion and salt corrosion and suitable for everything from arctic to desert weather conditions. The camera features hybrid image stabilisation technology and gyro-sensors to minimise the effect of external vibrations on imagery. In addition, the super dynamic function ensures a wider dynamic range compared to conventional cameras. Designed for applications at height, at sea and on ports, piers and bridges, the camera’s active sense technology responds to external conditions, initiating a built-in wiper, heater and defroster to continually capture the highest quality imagery in the most harsh of conditions. 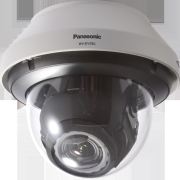 Gerard Figols, Product Marketing Manager for Panasonic Security Solutions, said, “The Aero PTZ is the most rugged security camera on the market and is capable of withstanding more extreme conditions than ever before. It will reliably produce sharp, crisp images, whatever the weather. The 360⁰ aerodynamic spherical design minimises wind resistance allowing the camera to operate successfully at wind speeds of up to 135mph. A ‘radius bodyline’ helps deter snow and dirt build-up on the light-weight, fibreglass body. 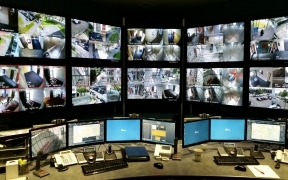 Available in three colours, the camera is IP67 rated and vandal proof to IK10 standards. It has a sphere pan-tilt mechanism allowing endless 360-degree panning and a 90° to -180° tilt range.